The atmosphere of the Earth has been changing continuously since its formation. The Sun, the Earth and other planets were formed when matter coalesced from a rotating nebula approximately 4,567 million years ago, according to the most widely accepted theory. The solar nebula originated from the explosion of older stars containing heavy elements like iron that had been created by nuclear fusion of lighter atoms. The accumulation of mass at the center of the rotating nebula was so large that gravitational compression initiated the fusion of hydrogen into helium thus giving birth to the Sun which became a new shining star. The planets orbiting the Sun formed by accretion; the heavier elements concentrated in the cores and the lighter gaseous elements became the atmospheres. Composition of the protoplanetary nebula. The most abundant chemical elements in the Sun are hydrogen (H 73.46%), helium (He 24.85%), oxygen (O 0.77%), carbon (C 0.29%), iron (Fe 0.16%) and smaller percentages of neon, silicon, magnesium, sulfur, etc. The atmosphere of Jupiter, which is the largest planet, is mostly hydrogen with about 10% helium and small amounts of other gases like methane, ammonia, hydrogen sulfide and water. These compositions indicate that the nebula from which our solar system originated was mostly hydrogen, helium and small amounts of heavier elements. Planets like Mercury, Venus, Earth and Mars which are close to the Sun lost their hydrogen and helium rapidly because their gravitational pull was not strong enough to retain these light elements. The loss of hydrogen and helium increased the concentration of heavier gases in the atmospheres of these terrestrial planets. Further away from the Sun where it is much colder, methane can condense as a liquid, and Saturn's moon Titan has a predominantly nitrogen atmosphere with pools of liquid methane on its surface. the atmosphere from the solar wind. When the material forming the Earth coalesced and melted, it organized itself into layers with dense materials at the core and less dense compounds closer to the surface. The gases comprising the atmosphere formed the outermost layer and had a composition similar to that of the gases of the condensing planetary nebula. During the Hadean Eon, the Earth's surface consisted of molten rock, a magma ocean, and water existed only as steam in the atmosphere. 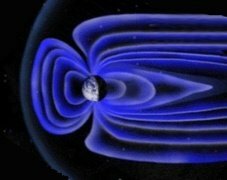 The circulation of molten metallic iron-nickel alloy in the core of the Earth established the magnetosphere, a region in space where the motions of gas and fast charged particles are controlled by the magnetic field of the Earth. 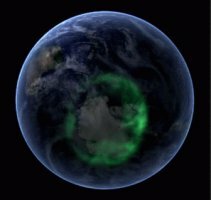 The magnetosphere deflects most solar wind ions before they penetrate the atmosphere, but the charged particles which are not deflected are directed toward the Earth's magnetic poles where high-energy collisions with atoms of the atmosphere produce an aurora light display. The average speed of hydrogen molecules and helium atoms is greater than the escape velocity from the Earth, and these light gases were lost and swept away through photoevaporation by the solar wind early in the Hadean Eon due to Earth's weak gravity. Around 4.45 Ga, the Earth experienced a violent collision with a planetoid called Theia that was about the size of Mars. The impact added extra mass to the Earth, but a portion of the impact debris went into orbit and accreted to form the Moon. Some scientists have proposed that this giant impact blasted away into space all of the Earth's atmosphere, including much of the water, and that the atmosphere and water were subsequently replenished by volcanic outgassing and impacts from asteroids and comets. A problem with this proposal is that the ratio of deuterium to hydrogen (D/H) for comets is very different from what is found in the Earth's oceans, so comets are not a likely source for Earth's water. Also, volcanic emissions do not have much nitrogen, so it is unlikely that volcanism provided the nitrogen in our current atmosphere. While it is true that a great collision would have sent much of the atmosphere into space, most of it would have remained within the Earth's gravitational sphere of influence and could have been recaptured by the Earth as the debris from the giant impact cooled and was partitioned between the Earth and the newly formed Moon giving both a similar chemical composition. After the hydrogen and helium had escaped, Earth's Hadean atmosphere was left with methane, ammonia, water vapor, and small percentages of nitrogen and carbon dioxide. A cataclysmic meteorite bombardment around 3.9 Ga kept much of the Earth's surface in the molten state, and the incoming impactors may have brought additional water, methane, ammonia, hydrogen sulfide and other gases that supplemented the atmosphere. The high surface temperature of the Earth during the Hadean eon favored the depletion of atmospheric methane through the endothermic reaction of methane with the steam in the atmosphere. Reactions such as the following require high temperatures of approximately 700°C to 1100°C which would have been common in the hot crust and magma lakes of the Hadean Earth. The resulting carbon monoxide would readily combine with metals to form carbonyl compounds. Methane reacts with steam to produce carbon monoxide and hydrogen. The Hadean Eon was too hot for liquid water to condense on the surface of the Earth, but water vapor would have been able to condense at high altitude in the atmosphere and produce rain that evaporated quickly as it fell when it approached the ground. Toward the end of the Hadean Eon, volcanic activity started increasing the percentage of carbon dioxide in the atmosphere. The Earth's surface changed from molten lava to solid rock, and liquid water started to accumulate on the surface. The crust of the Earth started to cool down during the Archean Eon. The amount of water vapor in the atmosphere decreased as water started condensing in liquid form. Continuous rainfall for millions of years led to the buildup of the oceans. As steam condensed into water, the atmospheric pressure of the Earth became lower, and the water started dissolving gases like ammonia and removed them from the atmosphere creating ammonium compounds, amines and other nitrogen-containing substances suitable for the origin of life. The condensation of water with gases such as sulfur dioxide produced acid rain that created new minerals on the Earth's surface. Volcanic carbon dioxide peaked during the Archean Eon and started to decrease through the formation of carbonate minerals that resulted from reactions of metals with the carbonic acid generated from carbon dioxide and water. Microfossils of sulfur-metabolizing cells have been found in 3.4-billion-year-old rocks, and it is known that the first aquatic photosynthetic organisms originated around 3.5 Ga. The oxygen produced by cyanobacteria (blue-green algae) during the Archean Eon reacted with the metal ions in the anoxic sea. Billions of years would pass before the photosynthetic microorganisms could eventually change the composition of the atmosphere. By the middle of the Archean Eon, the Earth had cooled enough so that most of the water vapor in the atmosphere had condensed as water, and the Earth had its first days without clouds. Ammonia and methane were only minor constituents of the atmosphere. Carbon dioxide comprised about 15% of the atmosphere and the percentage of nitrogen was 75%. In essence, most of the original components of the atmosphere had escaped, precipitated as liquids or reacted chemically to form solid compounds. The volcanic activity and the photosynthetic bacteria were now the major factors influencing the Earth's atmospheric composition. Other organisms capable of photosynthesis used the energy of sunlight to convert the abundant carbon dioxide and water into carbohydrates (C6H12O6) and oxygen, which was deadly to the anaerobes. By the first quarter of the Proterozoic Eon, the Sun had become brighter and its luminosity had increased to 85% of the present level. By this time, most of the carbon dioxide had been depleted from the atmosphere, leaving nitrogen as the main atmospheric gas with a small percentage of oxygen. Nitrogen gas (N2), which is quite inert chemically, had been a small percentage of the Earth's atmosphere during the Hadean Eon, but it became the major component of the atmosphere during the Proterozoic Eon once all the other gases were gone. The Earth's surface and seas contained great quantities of iron that readily combined with oxygen to produce iron oxides. From the beginning of the Proterozoic Eon to 1.85 Ga, atmospheric oxygen levels rose as the rate of photosynthesis increased considerably. Shallow seas became partially oxygenated but the deep oceans continued to be anoxic. Although photosynthetic organisms had been releasing oxygen since Archean times, the oxygen levels could not build up in the atmosphere because the oxygen was being depleted by the oxidation of metals and by the oxidation of methane to yield carbon dioxide and water in the presence of ultraviolet (UV) radiation. The cooling of the Earth during the Proterozoic stabilized the land masses and reduced the volcanic outgassing of carbon dioxide. Methane and carbon dioxide are greenhouse gases; their decrease in the atmosphere may have contributed to the Huronian glaciation that lasted from 2.4 Ga to 2.1 Ga. The cold temperature sequestered additional methane from the atmosphere by forming methane clathrate, a crystal structure of water similar to ice that traps a large amount of methane. An increased period of oxygen production occurred between 2.4 Ga and 2.0 Ga and is known as the Great Oxidation Event or Oxygen Catastrophe. 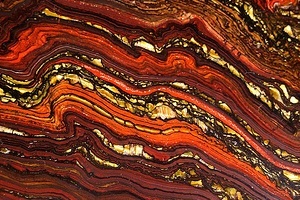 The higher oxygen level created banded iron formations (BIF) by precipitating dissolved iron. The reaction of oxygen with iron in its reduced state (Fe2+) continued to create BIF deposits of iron in its oxidized state (Fe3+) until about 1.9 Ga whenever volcanic activity or crustal plate movements exposed unoxidized iron. Additional oxygen continued to be consumed by oxidation of minerals on the Earth's crust, but enough free oxygen accumulated in the atmosphere to kill anaerobes near the Earth's surface thus creating an opportunity for the development of aerobic life forms. Starting around 2.4 Ga, oxygen molecules migrated into the upper atmosphere and formed an ozone layer. This is a region in the stratosphere located between 15 to 35 kilometers above the Earth's surface where oxygen molecules (O2) are converted to ozone (O3) by the Sun's ultraviolet rays. The reverse conversion of ozone back to oxygen releases heat. The ozone layer basically absorbs high-energy ultraviolet radiation and converts it to heat. The high energy UV light is dangerous for life because it can cause mutations in DNA sequences. The atmospheric composition was very steady between 1.85 Ga to 0.85 Ga. During this time, Earth's atmosphere had approximately 10% oxygen. Photosynthetic organisms were still producing oxygen at a high rate, but the reaction of oxygen with dissolved minerals in the deep oceans and with rock and clay on the Earth's surface did not allow atmospheric oxygen levels to increase. By 0.85 Ga, the minerals in the sea and on land could not bind as much oxygen, and the excess oxygen began to accumulate in the atmosphere. With the increased oxygen levels and the protection of the ozone layer, organisms capable of aerobic respiration could now proliferate all over the surface of the Earth. The beginning of the Phanerozoic Eon, the Cambrian period, is marked by an abundance of multicellular life. Most of the major groups of animals first appeared at this time. Vegetation covered the surface of the Earth, and oxygen accounted for 30% of the atmosphere. Air enriched with so much oxygen allowed giant insects to develop and caused frequent forest fires set off by lightning. A great mass-extinction event occurred 251 million years ago (0.251 Ga) marking the boundary of the Permian and Triassic periods. Oxygen levels dropped from 30% to 12%, and carbon dioxide levels reached about 2000 ppm. This was Earth's worst mass extinction and it eliminated 90% of ocean dwellers and 70% of land plants and animals. The cause of this mass extinction is thought to have been a series of volcanic events in Siberia that lasted for about one million years and released large volumes of carbon dioxide and gases containing sulfur, chlorine and fluorine. [8,12] By 228 million years ago, oxygen levels had risen to about 15% of the atmosphere, and the first dinosaurs appeared. Oxygen levels continued to increase, and by the end‐Cretaceous, 100 million years ago, oxygen had risen to about 23% of the atmosphere. At this time, dinosaurs were well established and modern mammals and birds began to develop. For the last 100 million years, the percentage of oxygen has fluctuated between 18% and 23% to the present level of about 21% of the atmosphere. The following table shows the percentages of the five most common gases in today's atmosphere. Since the beginning of the industrial revolution in 1750, humans have been burning coal and petroleum products to provide the energy to power machinery. The combustion of fossil fuels has been generating large quantities of the greenhouse gases carbon dioxide (CO2), methane (CH4), and nitrous oxide (N2O). The chart below shows the levels of atmospheric carbon dioxide during the last millennium and the sharp rise during the twentieth century. The concentration of atmospheric carbon dioxide today is approximately 400 parts per million (ppm) and the North Pole's mean annual temperature is -20°C. When the carbon dioxide concentration was 2,000 ppm 55 million years ago during the Paleocene–Eocene Thermal Maximum (PETM), the North Pole's temperature averaged 23°C (73.4°F). It is thought that elevated levels of greenhouse gases will cause global warming and influence weather patterns. Many cities bordering the coastal areas will be permanently flooded if the ice deposits in Greenland and Antarctica melt. A New Sun: The Solar Results From Skylab, by John Eddy, NASA SP-402, 1979, page 37. Rye R, Kuo PH, Holland HD, Atmospheric carbon dioxide concentrations before 2.2 billion years ago, Nature, 1995 Dec 7; 378(6557):603-5. Wacey, D., Kilburn, M. R., Saunders, M., Cliff, J., Brasier, M. D., Microfossils of sulphur-metabolizing cells in 3.4-billion-year-old rocks of Western Australia, Nature Geosci. //dx.doi.org/10.1038/NGEO1238 (2011). Stanley, Steven M. (1999). Earth System History. New York: W.H. Freeman and Company. p. 323. ISBN 0-7167-2882-6. Kristina A. Curry Rogers and Michael D. D'Emic, Triumph of the Titans: How Sauropods Flourished, Scientific American, May 2012, Vol 306, Number 5, p. 52. David Jewitt and Edward D. Young, Oceans from the Skies, Scientific American, March 2015, pp. 38-43. Stofan, E. R.; et al. (2007). "The lakes of Titan." Nature 445 (7123): 61–64. (4 January 2007) doi:10.1038/nature05438; PMID 17203056.